Sarah, you can Facebook or email me which book from my May Bookshelf Reviews you'd like, and I'll get it to you:) Congrats!! And thanks so much not only to you, but to all of you who've followed or liked my sites. It truly means so much! Now let's keep the love-fest going straight into today's review because I love Francine Rivers, and I have for years. She is one of the very first CBA authors that stood out to me, and if you've ever read a book by her you know why. If you haven't, then you need to start. Pick anything up with her name on it, and you'll be happy! Today, though, I've got her newest to chat about. Here goes! Alright, confession time here...I picked up this book at our church library on Sunday with every intention of having it read, but then my week went a tad crazy. I had a few things writing related that I had to accomplish, so I didn't get this fully read! However, what I can say is how deeply it has drawn me in from page one. Not only are the characters rich, but the story has just enough questions to keep me turning the page. Francine is so amazing at writing characters and their struggles with such authenticity and relatability that I truly feel like I know them. And I love, love, love how Truth is always at the core of all her stories, and this one is no different. I'm mid-way through and I have no doubt, now that my schedule is a bit more free, I'll have it finished very quickly. If you'd like to purchase Bridge to Haven, you can find it here. And if you'd like to know more about Francine Rivers, you can visit her website, here. Happy Friday, all! Happy Friday! I've been meaning to get this book. You've encouraged me to work harder to find it. Francine is an amazing author. One of my greatest shames as a reader of Christian fiction is that I still haven't read Redeeming Love! I have to read it sometime. And I'll check out this one, too. Thanks for the recommendation! What??? Let me pick myself up off the floor, lol:) RL is an amazing book you'll have to squeeze in someday. Now this one too! Thank you for the book! I can't wait to get it. 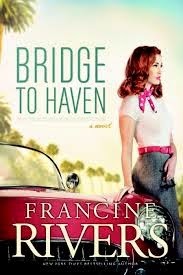 I have to agree with you about Francine Rivers...I love her writing. Redeeming Love is one of the few books that I have read multiple times and I can't think of any of her books that I didn't enjoy. I will definitely read this one, too. I'm really looking forward to this one!! Redeeming Love is one of the first books I read as a Christian, and it remains one of my favorites. Thank you for sharing your initial thoughts on this one; have you finished?